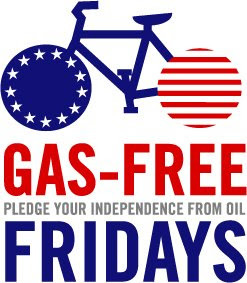 Spurred by soaring gas prices and our country’s overdependence on oil, bicycle advocates are urging Americans to show their patriotism this July 4th, what they’re callingIndependence from Oil Day, by pledging to make more gas-free trips. The “Gas-Free Fridays” campaign aims to get more Americans on bicycles this summer, recognizing thathalf of all driving trips are under two miles in length. With national gas prices exceeding $4 per gallon, and with mass transit increasinglycrowded, Americans are discovering how easy and cost-effective it is to commute bybicycle, sending bike ridership numbers higher than ever. “More people are recognizing the economic benefits of biking for transportation, not to mention the health and environmental benefits,” says Leah Shahum, Executive Director of the 9,000-member San Francisco Bicycle Coalition. “We urge more Americans to do their part by taking the Gas-Free Fridays pledge this Summer.” San Francisco has seen a 30% increase in the number of people commuting by bicycle in the past year alone. New York City has seen a 75% increase in bicycle commuting since 2000. “Sales of commuter bikes doubled this year in New York City, and many local bike shops have simply sold out,” says Paul Steely White, Executive Director of the 6,000-member Transportation Alternatives. Bicycle traffic on Philadelphia’s bridges increased 15% in the last year. “There hasnever been a better time to declare independence from your car and enjoy the freedom and benefits of using your bike,” said Alex Doty, Executive Director of the 1,200-member Bicycle Coalition of Greater Philadelphia. Advocates hope that “Gas-Free Fridays” will encourage even more Americans to develophealthy, sustainable commuting habits that will ease the financial burdens ofskyrocketing gas prices and reduce our country’s dependence on oil. In one year, riding a bicycle versus owning and driving will save an individual $8,000. On average, commuting10 miles a day by bike instead of car burns 110,250 calories (keeping off 30 pounds of fat each year) and saves 3,500 lbs. of greenhouse gas emissions each year. I'm in, although I am already a "gas free every weekday" type of guy. This is a great idea, I hope no one minds if Denver appropriates it as well.